Enter the Magical World of Children and KinderRead Where Learning to Read Is Fun! We provide the right materials for those "teachable moments". 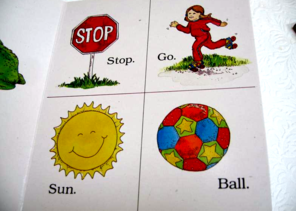 These Early Readers contain three sturdy board books which introduce a simple controlled vocabulary; few words are introduced in Book 1, then reinforced and new words are added in Books 2 and 3. 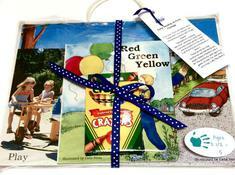 Finally, a "play book" with games and activities in Book 4 reinforce the illustrated words. This gives children confidence and a head start when they are most sensitive to learning, and reading takes place most easily. special need students up to grade level. In a recentTime article (9/5/2016), nine "ordinary families" with "extraordinary kids" were examined by author, Charlotte Alter. She describes a typical parent who said, "She did arts and crafts projects with her toddler daughters, took them to the library every week and taught them to read, count and swim before they even set foot in a classroom." The parents provided stimulating environments and confirmed the conclusion of developmental experts that "the first few years of a child's life are among the most important for learning and brain development."